Helping my kids develop a lifelong love of reading is one thing that I think about a lot but often on a day to day basis I don't feel like I do a great job making time for reading! Two of my favorite bloggers, Allie from No Time for Flashcards and Amy from Teach Mama, have written a book for busy parents (like me) that is filled with simple and easy tips for raising a reader. (This post contains Amazon Affiliate links). 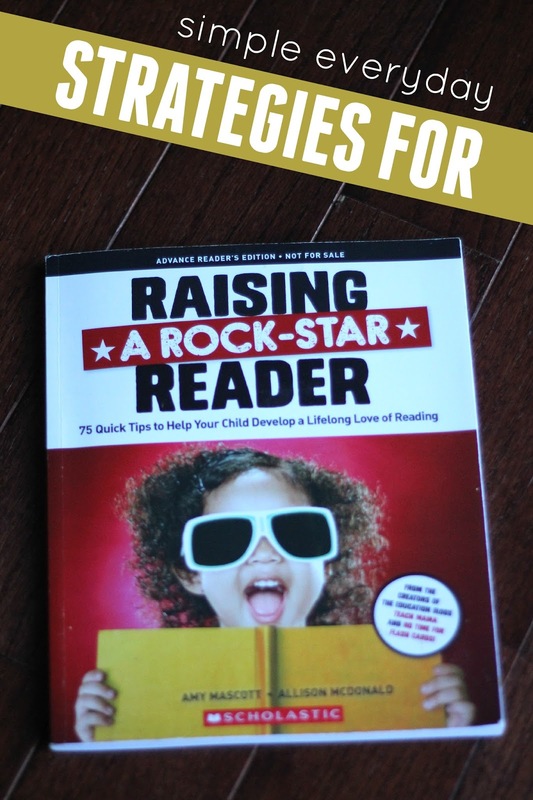 Today I am going to share one of my favorite tips from their new book Raising a Rock Star Reader and how I am using it with my kids! Once Raising a Rock Star Reader arrived at our house I sat down and bookmarked a bunch of pages with sticky notes. There are so many simple ideas to try that are easy to fit into our busy afternoon schedules. My 3 and 4-year-old have really been fascinated by rhyming words lately so we were drawn to Chapter 4 Sound Check: Playing with Sounds. Allie & Amy mention that "Rhyming is hugely helpful for helping kids learn to distinguish sounds in words. 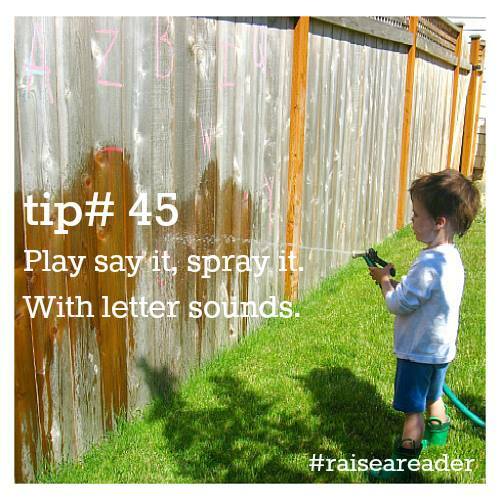 And rhyming is fun, which makes it a natural motivator for building vocabulary." 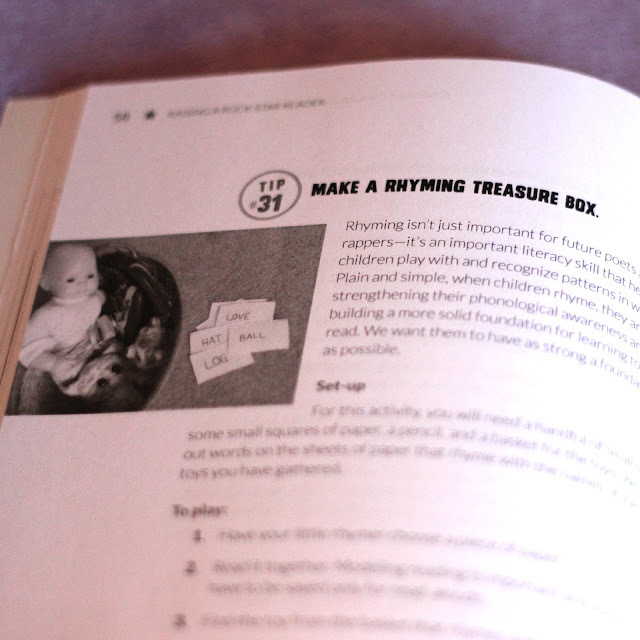 TIP #31 MAKE A RHYMING TREASURE BOX! To make a rhyming treasure box we got a basket and collected several small toys and put them inside the basket! The toys included a rabbit, dog, ball, cat, clock, and a few other things. Next we grabbed a Sharpie and some sticky notes. The kids pulled out one toy from the treasure box at a time and we wrote down words that rhymed with that toy on our sticky notes! Once we gathered up loads of rhyming words we stuck them all over the wall!! To play the rhyming game I would pull off one sticky note word and read it to my daughter and she would dig into the treasure box to find the toy that rhymed with that word. I also drew a picture next to almost every word to help her remember what the words said. She got SO EXCITED every time that she found a rhyming word match! (ie. like below when she found walk and clock). It was fun talking about the words and the letters and how some words that rhyme look the same while others don't! We played the rhyming treasure box game again and again... and again. My 3-year-old even joined in! After the rhyming treasure box activity was a success my daughter was anxious for us to try out another simple activity from the book! Our only problem now is deciding which one to do first! Raising a Rock Star Reader is filled with 75 quick tips to help kids develop a lifelong love of reading! My 7-year-old got so excited about our rhyming treasure box game that he made our family a rhyme sorting wall downstairs using all of our sticky words. He mixed them up and plastered them to one big wall and then encouraged my daughter to sort the words by sound. I think our next goal is to try out the Rhyme Bingo game that Allie and Amy have shared over on their blogs! 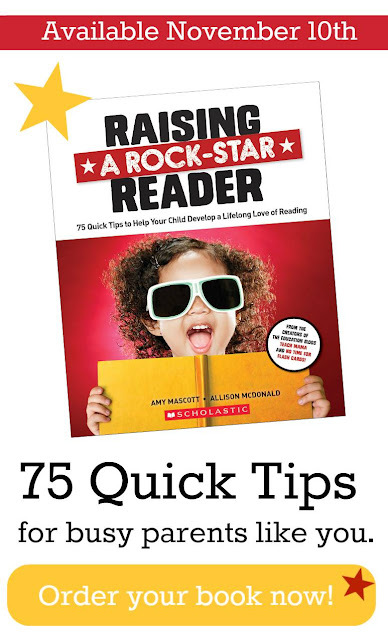 Raising a Rock Star Reader is going to revolutionize our afternoons now because it will be so easy to add these simple tips and activities into our busy schedule! Although I am creative and am a former elementary school teacher, somedays I just want to pull out a book and have someone else come up with the ideas for me! Allie and Amy explain reading and their reading strategies using easy to understand language... not professional jargon! 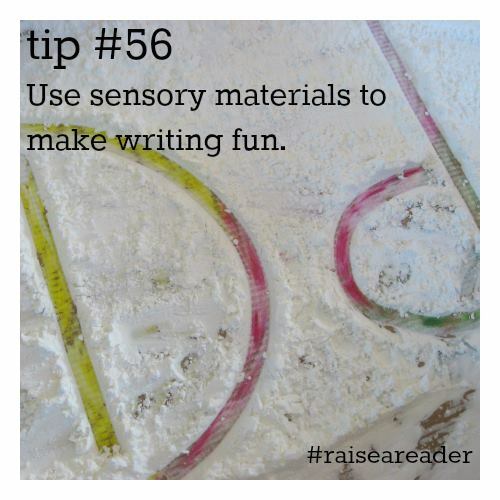 All of the activities are simple and don't require very many materials. The book is thin, quick to read, and the table of contents is so easy to use! Allie and Amy included book lists for different ages of kids!!! I love book lists because I am always looking to add new awesome books to our family library that are recommended by people I respect and admire! The back of the book includes some literacy apps and websites to check out! I think it is hard to sift through all of the different apps out there, so love that Allie and Amy are sharing their favorite resources with us! The book is so comprehensive and useful! The activities and ideas are so creative yet practical too! I love that there are 75 of them (and probably even more). You don't have to be a professional educator to be able to figure them out! 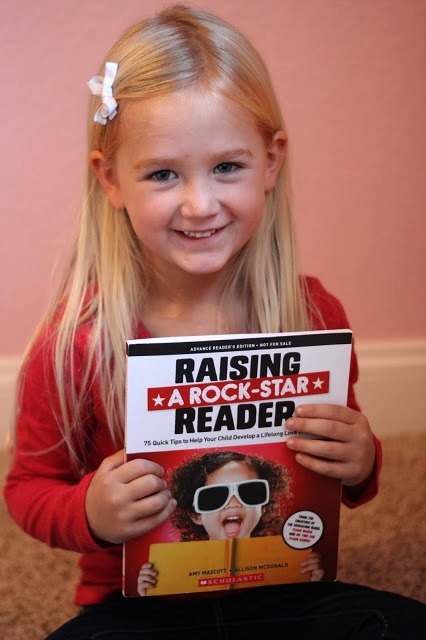 You can pre-order Raising a Rock Star Reader NOW and the book comes out next week on November 10th!! 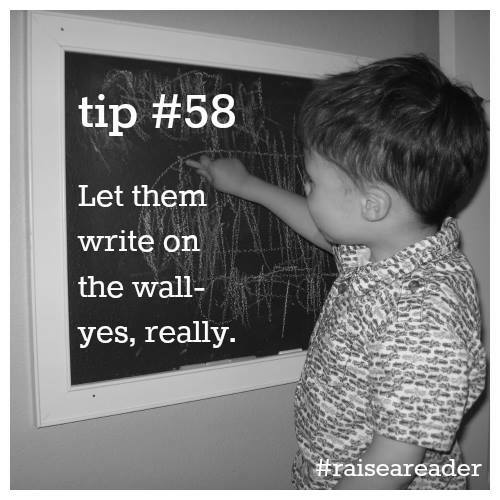 Do you have any other favorite simple reading strategies you like to use with your kids? 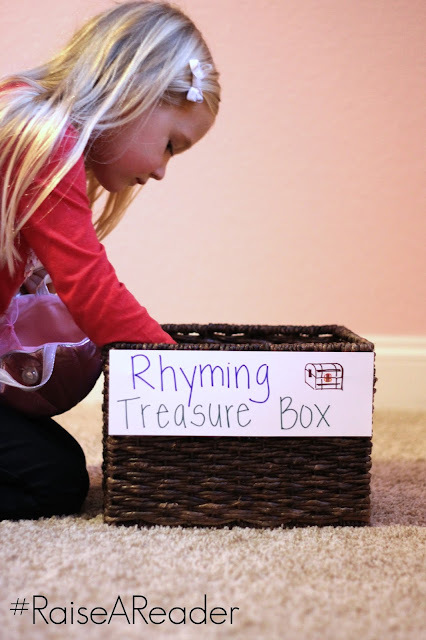 If you try out this rhyming treasure box activity, tell me how it goes!! Find more of our favorite reading strategies and resources on our Reading Activities Pinterest Board. Disclosure: Allie and Amy sent me a free advanced reader's edition copy of their new book to read and share with you! I was not compensated for this post. All opinions are mine.